Dan Gutman has been a family favorite for years. My children love his sense of humor. I love that while they are having a great time reading the books, they're also learning cool facts. Even though they are a little older now, Gutman will always hold a special place in our bookish hearts. I'm thrilled to share with you three new books from this fantastic author, along with a Q&A. Did you know that the word “independence” never appears in the Declaration of Independence? Did you know that soldiers in World War I collected thousands of glowworms in jars to help them see at night?! Learn more weird-but-true U.S. history facts with A.J. and Andrea from Dan Gutman’s bestselling My Weird School series. This all-new series of nonfiction books features hundreds of hysterical facts, plus lots of photos and illustrations. 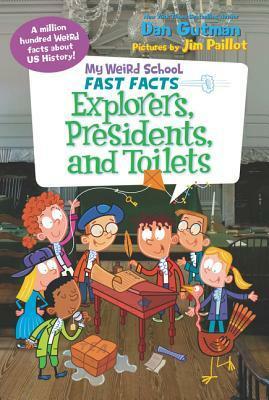 Whether you're a kid who wants to learn more about our country's history or simply someone who wants to know how many Americans are involved in toilet-related injuries each year, this is the book for you! 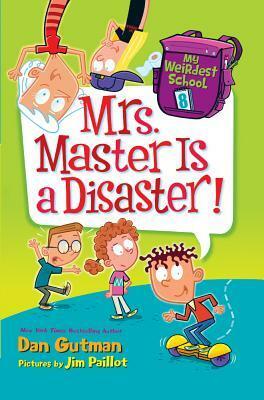 In this eighth book in the new My Weirdest School series, it s Grandparents Day at Ella Mentry School! Alexia s grandmother Mrs. Master makes weird inventions for a living, but A.J. and the gang come up with the weirdest invention of all. And they re going to make a bazillion dollars from it! Will they succeed? Or will their great big idea be flushed down the drain? Perfect for reluctant readers and word lovers alike, Dan Gutman s hugely popular My Weird School chapter book series has something for everyone. Don t miss the hilarious adventures of A.J. and the gang! 1. The first book in The Weird School series, Miss Daisy is Crazy, came out in 2004. Where did the idea for this series come from? 2. My Weirdest School launched in 2015. What's new for fans of A.J. and is gang? Big plans! First of all, My Weirdest School will continue with #9 ("Miss Tracy Is Spacey! ), #10 ("Miss Newman Isn't Human! "), #11 ("Mr. Will Needs To Chill! ), and #12, which isn't named yet. After that, I'm starting a NEW series, which will be called "My Weird School Year." 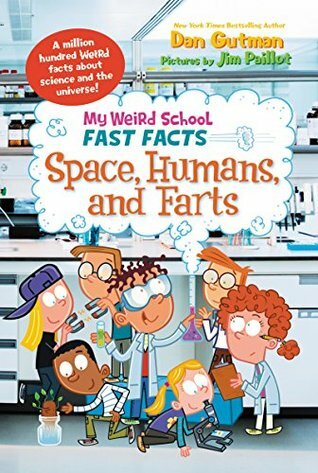 In addition, My Weird School has been spun off into a non-fiction series called "My Weird School Fast Facts," in which A.J. and Andrea argue with each other about topics such as sports, geography, U.S. History, Science, and Animals. Not only that (! ), but we've started an "I Can Read" series of My Weird School books for kids who are just learning how to read. And finally (if that's not enough), there will be more My Weird School specials, about summer, President's Day, and a book filled with puzzles, games, and jokes. That oughta hold 'em for awhile! 3. My eldest child was a reluctant reader, but he loved The Weird School series. How did you find that perfect balance of education and humor that draws kids in? Wait. What? Did you say education? There's no education in My Weird School! These books are just for fun. My goal is to make stories that are so captivating that a boy or girl will look up after an hour and say, "Wow! That didn't even feel like I was reading. It seemed like I was watching a movie in my head!" 4. What books/authors inspired you growing up? None! I hated to read when I was a kid. I thought reading was boring and hard to do. I guess that's why I relate well to reluctant readers. Because I WAS one. But I'll tell you what DID inspire me growing up. The Beatles. Mad Magazine. Rowan and Martin's Laugh-in. Get Smart. National Lampoon. Monty Python. Saturday Night Live. I love to ride my bike, throw a Frisbee, watch TV, read the newspaper, get together with friends, listen to music, go to movies, plays, comedy clubs, and explore New York City, where I live. Dan Gutman may be weird, but he is also beloved by kids, parents, and teachers across the country. His books include the My Weird School series (more than 12 million copies sold), the Baseball Card Adventures (more than 1.5 million copies sold) and the New York Times bestselling The Genius Files. We also publish his spoofy picture book, Casey Back at Bat, and one of Dan’s favorites, Johnny Hangtime. Dan lives in New York (a very weird place), with his weird wife, Nina. You can visit him on Facebook or at his weird website: www.dangutman.com. Jim Paillot lives in Arizona (another weird place) with his weird wife and two weird children. You can visit him on his weird website: www.jimpaillot.com.